Model iPaq hx4700 heads a PDA line by HP. From all HP announcements made in summer this handheld turned to be of interest, other models either disappointed frankly (iPaq rz1710) or led to a misunderstood (the iPaq rx3000 series). None of them was innovative, rather on the contrary. Besides they were definitely overpriced. 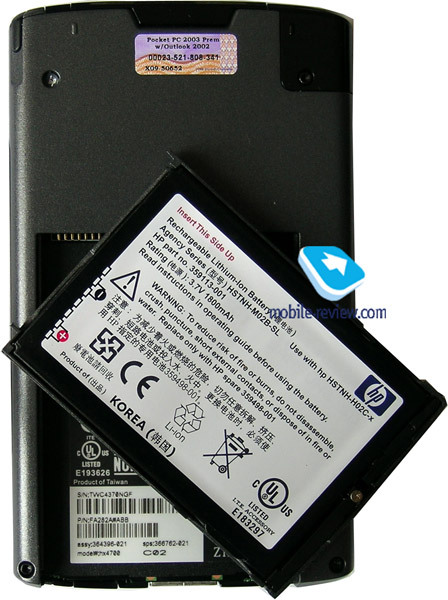 It's quite another matter with HP's flagman HP iPaq hx4700. If we innumerate its strong points and innovative moments and avoid exaggeration, we'll have the following picture: the best screen among all PDAs, the highest capacity battery, metallic shell, a touchpad. Is it not an ideal PDA? Alas, there is hardly anything ideal in the world, this handheld doesn't make an exception. This review is aimed to analyze weak and strong points of hx4700. 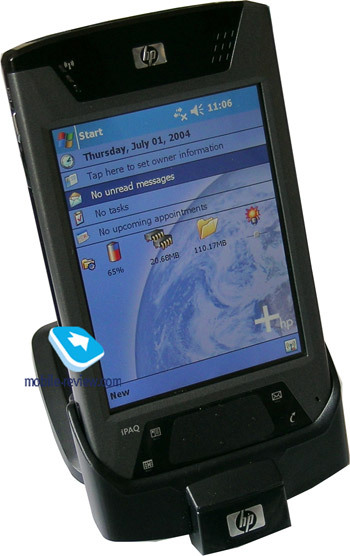 We'd say in advance, the appearance of this PDA was a big event on the PDA market in 2004. 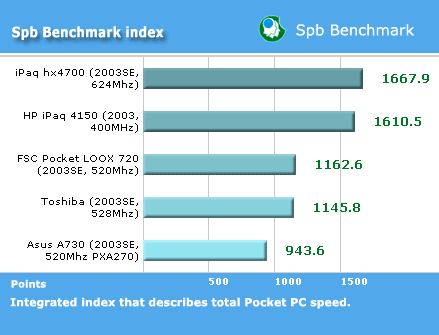 A modern Pocket PC of Hi-End class should have the essential minimum of specs, i.e. a processor of 520 MHz frequency or higher, RAM 64 MB or higher, two built-in wireless adapters, and the main point - a screen of a 640x480 pixel resolution. We can add to the list a dual slot, however you can object, many wait for single slot PDAs with VGA screen, however there haven't been any announcements for far. This handheld complies with the minimum set of specs, as well as its direct rivals FS Pocket LOOX 720, Asus MyPal A730W, Dell Axim X50v. Model hx4700 has a strict business style. Broken straight lines separate black plastic from dark grey metal. Rounded edges are only on top and bottom ends, but they blend with the strict design. The front side looks symmetric by vertical and horizontal axes. The fact highlights the work in the landscape mode. Color solution and design concept are typical for the whole new HP line (I won't be surprised to know if the design of junior models was prompted by the senior model), the link is obvious. In all, the handheld features a winning design, which is free of excessive originality, futuristic style, but it's not that simple to be called clumsy. 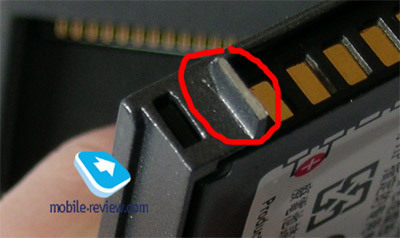 The insertions above and under the screen and at sides covered with black plastic. I'd say, it gets fingered very quickly. Fingerprints stick to it, you notice it clearly when the handheld is new from the box. However you get used to it in a couple of days. The rest part of the shell consists of magnesium-alloy. This mixture of plastic and metal is to compromise on weight and the desire of the metallic shell. Many don't know that the metal is hidden under paint spraying (you can make sure of it, if you look at the technological cut at battery compartment cover). An experience of a long exploitation under imperfect conditions revealed that the spraying is durable, the color doesn't peel off. There is only one spot where the color might peel off in a time - at the silo top (it's hardly noticeable). The assembly quality deserves only praise. Indeed the device feels metallic in hands. All details match each other safely, the battery compartment cover is fixed firmly. The construction has no backlashes. In every my review I repeat that high assembly quality is typical for HTC the production from HTC plants (an ODM partner of HP, which produces most of the handhelds for it). 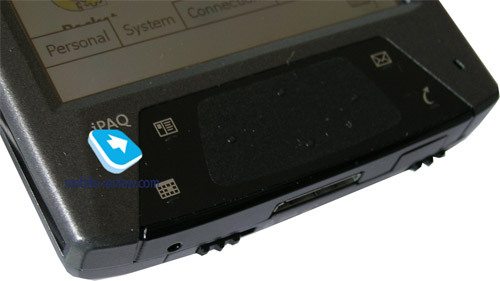 HP iPaq hx4700 is the only device among its competitors with the metallic shell. It's a good competitive advantage, which adds security and status - an important psychological factor to make a choice. The size of the PDA is far from the small, even if we compare with direct rivals only (131x77x14.9 mm). 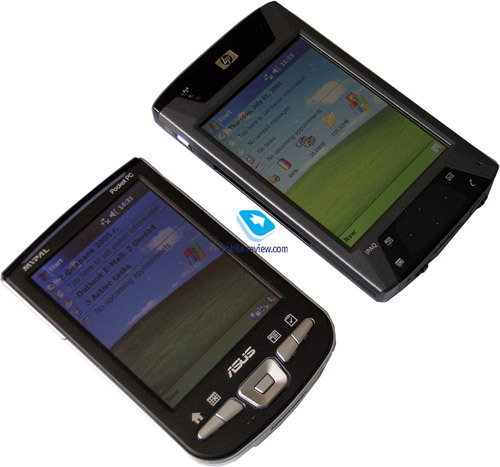 Compare it with Asus A730 (the smallest VGA Pocket PC). 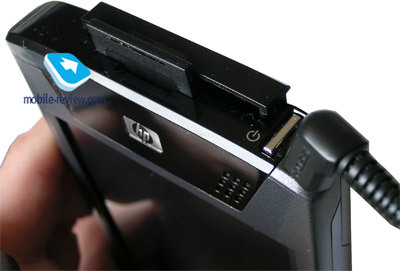 It's a very thin dual slot PDA: the first thing you pay attention to is its thickness (14.9 mm). This factor often compensates for other excesses. Model iPaq hx4700 turned to be more comfortable in use than it seemed looked on pictures. It fits the hand better than Toshiba e800. However as for the overall ergonomics, we'll speak about it later. The device is weighty in a pocket, but not that heavy. I'd note, many potential buyers do not hurry to buy the iPaq hx4700 because of its weight and size, they are waiting for a compact solution with the a VGA screen (the intrigue is that, who will be the first to offer such a product). 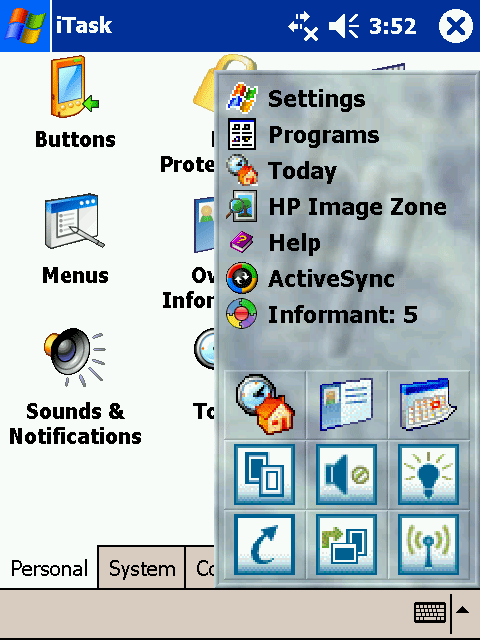 The area above the screen has a silver HP logo in the middle. There is an integrated dynamic to the right. At the highest volume the sound is relatively clean, there aren't any creaks. It's not very loud, but you hear it well broadcasting an Internet-radio, while you prepare breakfast, for example. There are 3 indicators to the left from the logo. The top one lights up, when a wireless adapter is on. The middle indicator glows green for a missed appointment, blinks amber when the device is charging, and is steady amber when the PDA is fully charged. The bottom indicator is the illumination sensor. There is nothing on the right side. On the left side are a voice recorder button and a hollow for the screen cover mount. I was disappointed with the voice recorder button. It won't do to browse e-pages - too tight and not comfortable. The screen cover deserves some attention. It is easy to fix and remove, pull it up and to the left. When closed the cover is firmly fixed by a small magnet. However the practice shows that not all magnets are equally useful. Some of them can erase the paint spraying at the contact spot. It depends on the sample - my sample got no abrasion over 3 months, and my friend faced the problem in a couple of weeks. The cover makes the screen slightly dark and distorted. It's possible to work with the flip cover closed and use the touchpad instead of the stylus. At the top end all the elements are huddled together. Two slots for extension are located in the middle. Other elements are crowed at the edge - the on/off button, audio jack and the silo. Such location feels inconvenient. Firstly, if the headphones are plugged, you should to arch your finger to access the on/off button, when the PDA rests in the right hand. Secondly, the stylus always aims to the audio jack, and if you make effort, the stylus might even get stuck there. The stylus is made of a black plastic, the same like in other models from the new series. It is comfortable to handle and has an average weight and size. It rests safely in the silo, so it will hardly get lost by accident. There is the standard 3.5 mm headphones jack. The sound in the headphones is one of the best, like in FS Pocket LOOX 720. 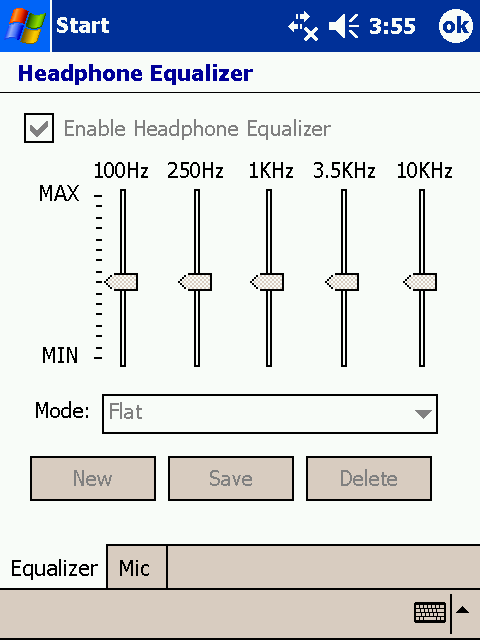 There is an integrated equalizer (IPAQ Audio). The headphones jack is combined with the mic. So you can use the PDA with the wire headset to enable IP-telephony, for example. Unlike the LOOX 720 this handheld has no additional dynamic, so you can't talk without a headset. The bottom end comes with the following elements: the infrared port that supports FIR, the standard synchronization connector, the battery compartment lock and the reset button (tip it with the stylus). The back panel has nothing to talk about. There is one control element left, the most interesting one, to my mind - it's the touchpad. It is surrounded by 4 buttons, which are ordinary, not sensor, they look like they are part of the touchpad, but they aren't. For the first time a touchpad takes the place of a D-pad to assist in navigation. The touchpad is found on just about every modern notebook, this time it's just of a smaller size. This innovative moment roused heated discussions before the release of the model to the market, and after it disputes continued. The opinions were equally divided: some got used to the touchpad and find it very comfortable, others reject the idea of the touchpad in a PDA, as the screen itself represents a big touchpad. In any case it isn't that comfortable as in notebooks, it's a matter of size (the surface in the PDA is 5-8 times little). I'd focus on two moments. Firstly you'll have to get used to the touchpad, irrespective of the experience with PDA and notebooks. Secondly, it is basically unusable for playing games. The software for the touchpad was developed by Synaptics, the company popular on the notebook market. The touchpad can work in two modes. The first, called Navigation Mode, it works like a D-pad. After you tapped the touchpad, the system tries to define most probable direction (there are 4 bumps). The second option is called Cursor Mode. It is implemented the same way as in notebooks. Hold Contacts button or use settings to switch modes. 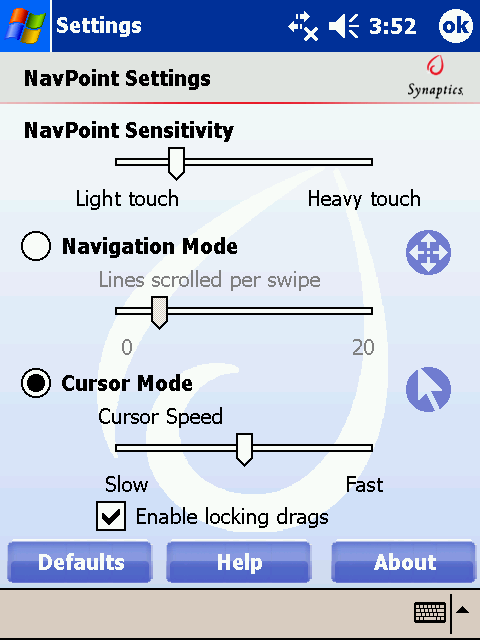 By the way, in the settings you can adjust sensitivity, cursor speed, number of lines to browse. The cradle matches the looks of the hx4700, it blends with the style of the recent iPaqs. A part of it is made of a black uneven plastic and the rest part - of a mirror-black plastic (like PDA panels). It also gets fingered. The cradle lacks the slot to charge a spare battery. The handheld can be charged via the cradle or directly via the cable or via USB. The screen features a 640x480 pixel resolution, 65K colors are displayed. The official specs suggest a 4" diagonal, in reality it is little bit shorter - about 3.96" long (the active zone, measured by the ruler). Now let's talk about the screen quality. 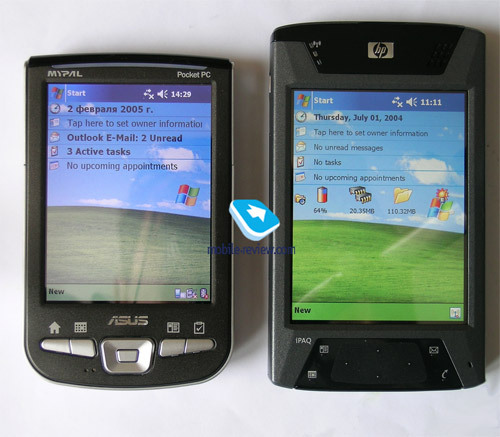 Dell Axim X50v and Asus A730 are equipped with SG Silicon displays by Sharp (comparable screens, the same diagonal, the Asus model has better white color rendering), HP iPaq hx4700 and FS Pocket LOOX 720 involve a VGA matrix by Sony. The latter stands out against SG Silicon: subjectively the image is more contrasting, the main difference is with better viewing angles. The image doesn't get inverted, even if you look at a zero angle. However if you look from the bottom the maximum viewing angle makes u 45 degrees. Compared with Fujitsu Siemens the screen in the iPaq is larger and has lots of backlight levels, the lowest backlight level represents almost dark screen. Given the overall performance the screen of hx4700 is the best at the moment. You can set auto backlight function on, it depends on the illumination. It works in the following way: the user sets the backlight level, and this figure gets multiplied by the illumination ratio. In general, this auto adjustment works well, but sometimes you can notice an interesting effect - with a slight change of the slop angle, the backlight level can change sharply. But I do repeat - there are almost no reprimands to it. Model hx4700 has a removable Li-Ion 1800 mAh battery in the senior modification, it's a larger standard battery than any other VGA Pocket PC. Out tests reveal that under the full load (the highest backlight, video playback, wireless adapters on) the PDA lasted for 3 hours sharp. Well, let's change conditions a little bit - Wi-Fi on, backlight level down to 33%, the PDA worked continuously for 3 hours 45 minutes. A good result! In the MP3 player mode (the screen off, the playback from the storage card) it worked for 12 hours 40 minutes. 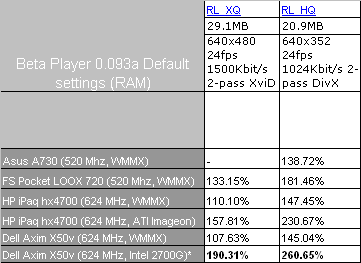 That means the battery life of hx4700 in all modes proved to be the longest among all VGA Pocket PC, slightly outpacing FS Pocket LOOX 720 (the difference is due to the battery capacity). The accessories for the model include an extended battery of 3600 mAh, i.e. you can double the results! All new iPaqs (except for the junior model) have two wireless adapters at once - Bluetooth and Wi-Fi. It has become a norm for Pocket PC platform, only the budget sector lacks both wireless adapters. Naturally, the adapters can work simultaneously. 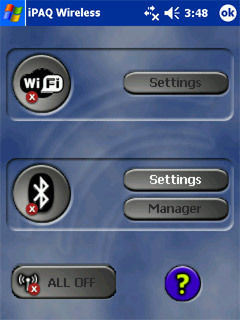 They are controlled by the iPaq Wireless utility, which can switch on/off each adapter and make all off by pressing one button. Bluetooth. Traditionally for HP this model comes with time-proved Broadcom drivers (earlier WIDCOMM). All necessary profiles are available, including the voice profile. We faced no problems with Bluetooth functionality, all profiles worked smoothly: Internet access via the phone, data synchronization with PC, exchange of files and content and so on. The driver's version is 1.5.0 build 2000. Wi-Fi. In Russia Wi-Fi has just started to gain popularity (mainly in Moscow), while Europeans and Americans have already appreciated the advantages of a speedy wireless Internet access. One of the key functions of the PDA (stream video and audio) won't be in great demand in Russia. As for the info security level, hx4700 is up-to-date - the support of WEP, WPA, 802.1x. There is a point-point support. The device has 64 MB of RAM onboard. The available RAM claimed is 62 MB, however the startup takes some 13 MB. Finally we have about 49 MB RAM available. This is quite enough to complete most tasks. The iPAQ File Store makes up 85 MB, it's not a big plus, as the price for 1 MB of SD memory dropped to 9 cents per MB. It comes in handy for the data backup, and when the battery charge is too low, the system sets off the power supply to memory cards, so you can't read an e-book stored on the memory card. The handheld is powered by Windows Mobile 2003 for Pocket PC Second Edition. Well, here we deal with non-standard built-in applications, the iPaq package is traditionally full of them. Pocket Informant 5. It's the best one of two preinstalled applications alternative to PIM. Its functionality and opportunities are wide, so it is worth of a separate review. iTask. It's a task manager to switch among the programs and close them. Note, with its help you can rotate or switch the screen off. DockWare. 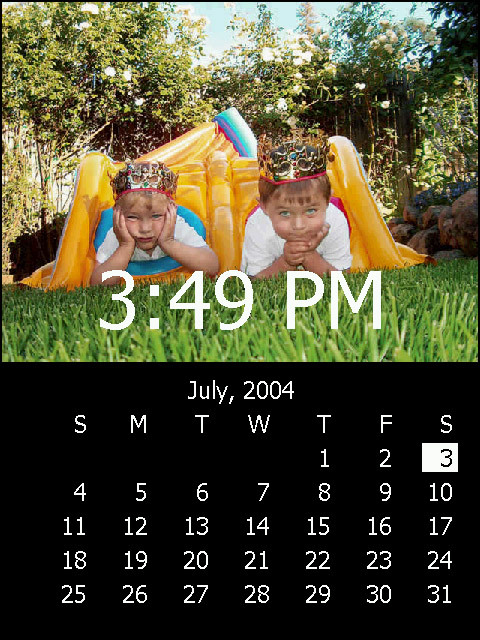 When the handheld rests in the cradle and is switched on, this application displays the calendar events for the current month and by turns shows photos from the folder "\My Documents\My Pictures". A kind of a desktop photo-frame. 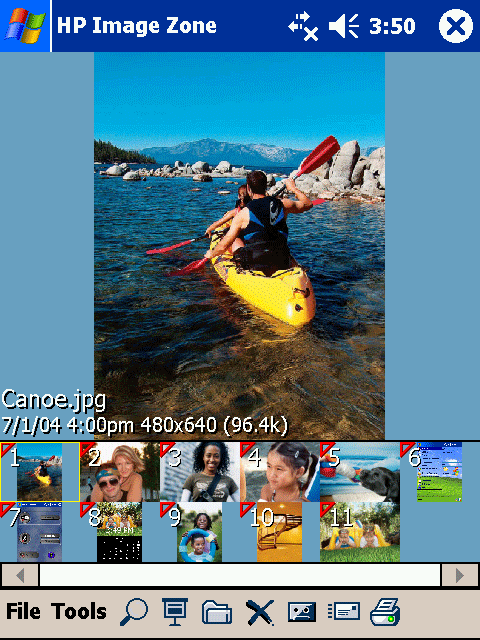 HP Image Zone is a traditional application by HP that views photos. iPaq Backup. It's a functionally utility to backup data, one of the best in its class. 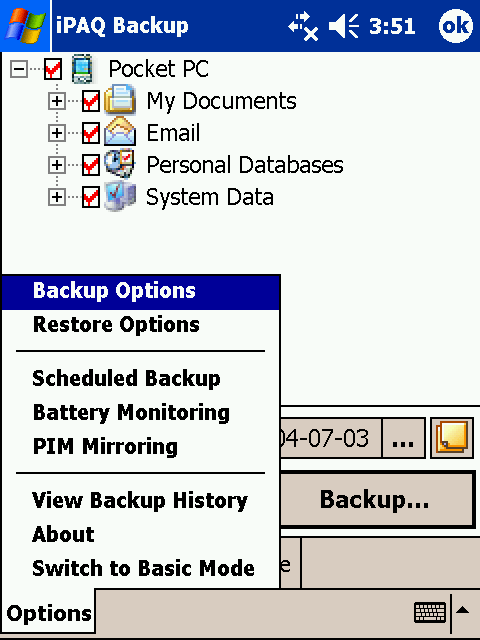 It can handle the backup on schedule, store organizer events in the non-volatile memory. It's one of the best in the PDA history. It has a magnificent screen, long battery life, stylish business design, built-in graphics accelerator, rich technical features. As a matter of fact, the device has just two shortcomings - its touchpad (many didn't take it adequately, it doesn't fit for gaming) and dimensions (it's the biggest among its rivals). Lots of users set much value to weight and dimensions, as to other specs. If you don't care much about its dimensions and the price and do not plan to play arcade games, it's the best choice for you today. 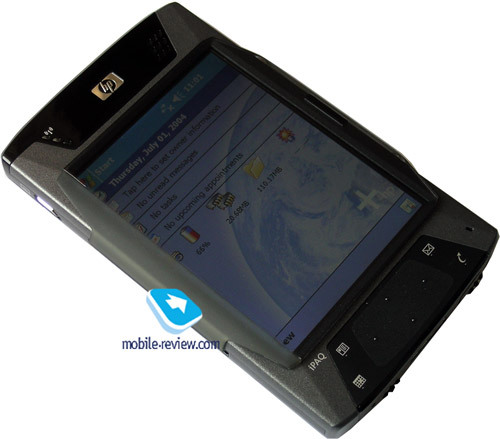 Currently when we think of a top PDA model to buy, we finally choose between HP iPAq hx4700 and FS Pocket LOOX 720/718. At the moment both models cost about $600. On the background we have Dell X50v and Asus A730W, they suffer from short battery life. 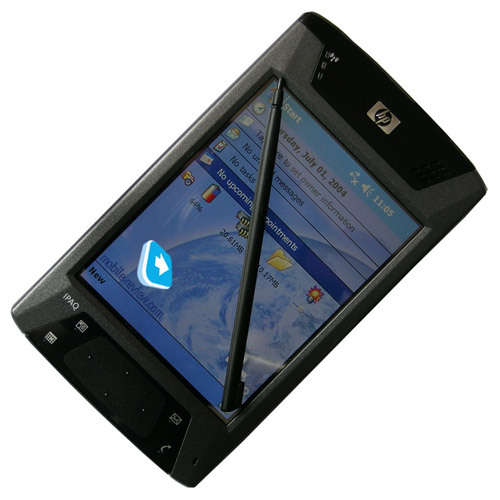 On our site you can read the comparative review of all Pocket PC with VGA screens. What's next? What will be the next surge of Hi-End Pocket PC? It's not difficult to predict, the answer is obvious. Hi-End Pocket PC will have more wireless modules set: for example, a traditional pair Bluetooth plus Wi-Fi (by the way, soon there will appear Bluetooth 2.0) will be extended by UMTS/GSM and GPS, that will be a norm. Naturally the devices will be powered by Windows Mobile Magneto. 2-megapixel auto focus built-in cameras will become ordinary.